Concept MOTOROiD / pet or autonomous motorcycle? 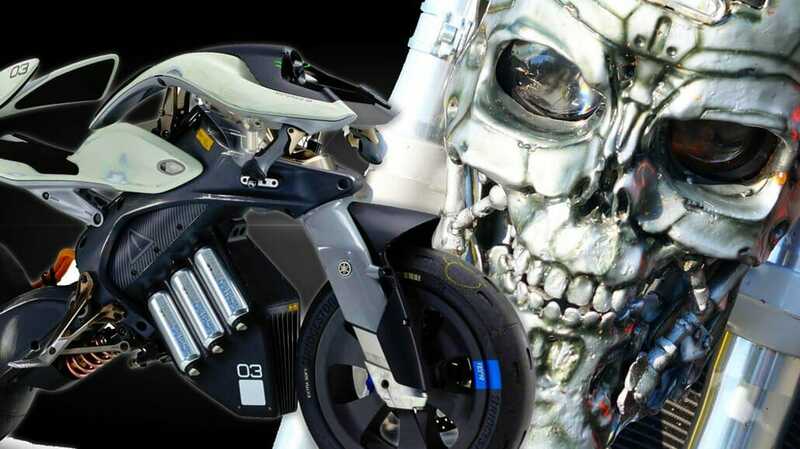 The concept MOTOROiD is to be presented at the Tokyo Motor Show and have an artificial intelligence. This strange futuristic motorcycle is supposed to recognize its owner and also to interact with him, supposedly as a living being. How exactly we can imagine this has not yet been announced, but this is probably a direction in which the future will move. Even if this concept is only to be shown what is currently possible. Since so far only these pictures can be found in the Internet, one can only speculate about the size. Some assume a kind of futuristic pet and some an autonomous motorcycle. I think an autonomous motorcycle is unlikely, since the technology is not yet so far and the pictures suggest a relatively small machine. The cables that go to the rear wheel would otherwise be extremely strong dimensioned. We will find out exactly at the end of the month at the Tokyo Motor Show. For Yamaha, the Concept MOTOROiD is not the first touch with an AI. Some time ago they developed the MOTOBOT. This is not a self-propelled motorcycle, but a robot that can drive a motorcycle independently. The goal is to develop the robot so far that he can beat Valentino Rossi on the racetrack. MOTOBOT 2.0 will also be featured at the Tokyo Motor Show. As already reported, Kawasaki is working on an artificial intelligence for motorcycles. Here, the AI is supposed to be supportive, because it is to help drive more safely and better. The AI passes on suggestions such as line selection, speed adjustments, but also navigation data and warnings of dangerous places to the driver. A new system, which is expected to be introduced into motorcycles in a relatively short time, has now been presented by the CMC, the Connected Motorcycle Consortium. The consortium houses BMW, Honda and Yamaha. What they have presented – Connected Ride. This is an assumption for many systems that should avoid accidents. A crossover and left turn assistant should be installed. But that is only a part of the actual system – a system that warns of possible impending accidents. Through vehicle-to-vehicle communication, V2V for short, and highly accurate satellite-based localization, different vehicles communicate with each other. If, for example, a vehicle fails to drive at a crossroads, the driver himself and also the other vehicles receive a warning in a display. This system is designed to help prevent accidents. The system is still in the beginning, you can see that by the big size. At the moment, it still completely takes the two sidecases of the BMW GS, but that should be solved soon. Honda, Yamaha and BMW are working together on this project to develop a common standard. What do you think where the trip will go? Should be used every safety feature or is it to you at some point too far? Does an autonomous motorcycle make sense at all? It’s all about driving, and you do not do it yourself anymore. What do you think?